I really like the Union Jack. Yes it’s trendy, it’s the thing to do now, but lots of people like it so why not ride the trend train for a while? 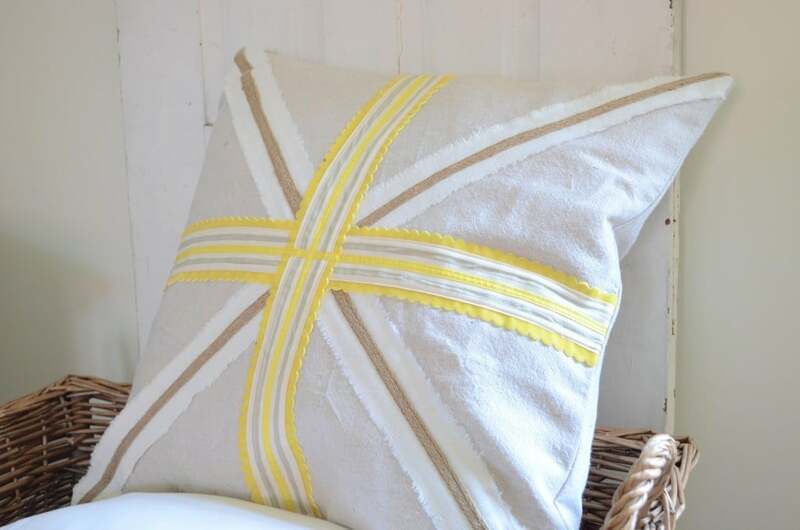 My Union Jack pillows have gotten a bit of attention out in blogland. Which is really fun for me and for the lovely lady I made them for. She was quite excited when I told her they had been a hit and said she just knew they would be. So now she can look at her cute Union Jack pillows and smile over the fact that they are a trendy fashion statement and lots of people out there love them. If you loved them too you can purchase one for yourself here. A couple of weeks ago I had a new etsy friend ask me if I’d like to trade pillow covers. She had one I had liked and shared on fb. Of course I said yes! She wanted a Union Jack but she wanted yellow. Here is what I came up with for her. Fun velvet scalloped ribbon that I found in my stash. 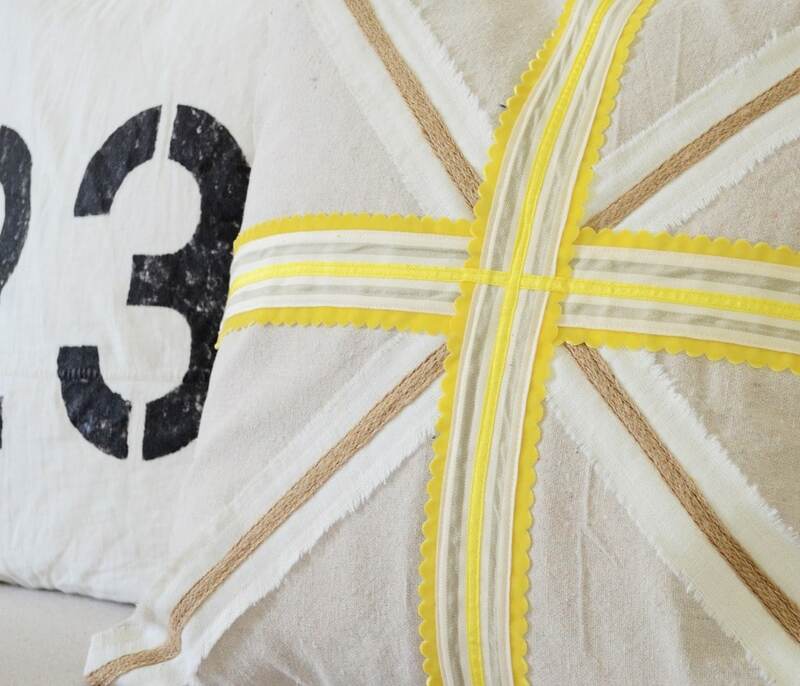 The narrow yellow is vintage seam tape folded in half to make it narrower. It went quite nicely with my painted number pillows on my couch! But if I kept everything I make I would qualify for the ‘Hoarders’ show, so I wrapped it neatly, added a yellow ribbon to the package and sent it on its way via USPS. 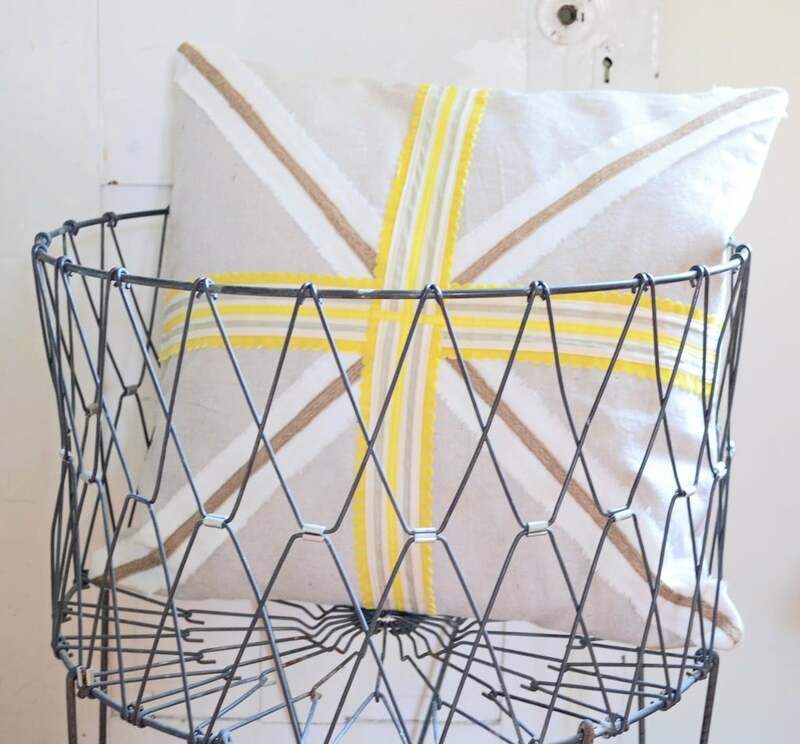 It even looks great in the basket I used to stage my red Union Jack pillows. I sent this pillow cover off, a couple of days later MY pillow cover arrived (I will share that one soon too) but this pillow cover failed to show up at its intended destination. I checked my delivery confirmation number. It was listed as undeliverable. It would returned if the return info was provided. Nice. I knew I had put my return address on it so I expected to get it back within a week. But a week went by and no return. Another week went by – no return. So I ordered more yellow ribbon so I could stitch up another one. Today the package arrived in the mail. I left out a numeral in the apartment number. Bummer. So I repackaged it, addressed it with great care and it is slated for tomorrows mail. In a padded Priority Mail envelope. I am convinced they take better care of the packages that are in the red, white, and blue priority envelopes and boxes. And delivery confirmation is a must. I even add insurance to a lot of stuff. Especially after waiting so long to get this one back that I thought I was never gonna see it again. Crossing my fingers that this time it gets to its destination post-haste!!! As soon as I know it is safe with its new owner I will get MY pillow cover on a pillow and start using it. I hated to be enjoying mine while hers was lost somewhere in the postal system! Have you ever lost anything in the mail? My family has. Something pretty big and pretty important to our family. I’ll have to tell you about it sometime. 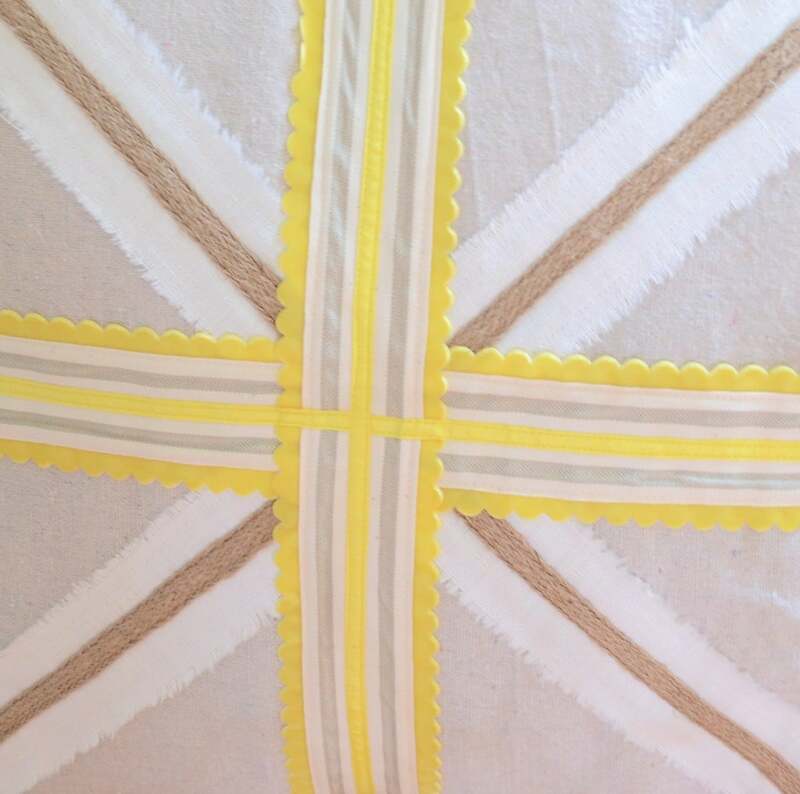 If you like this yellow Union Jack I can make you one too! I have more yellow scalloped ribbon on the way!! I love custom orders. What a bummer that it was lost and to have to pay for shipping a second time but what a relief to get it back again. I love that yellow – especially with the scallops. yeah the double shipping is a bummer but I’m just glad it was returned. Now I can use the ribbon I ordered to make another one to put in my etsy shop! I love the yellow, especially for autumn! Beautiful! Thank you Kimberly! Yellow is a fun fall color! I love your pillows! The yellow is really fun. And they look so soft too! Thank you Sharon! The inserts I have been using are feather inserts from IKEA. They are soft and the price is right! I am considering buying down and making some of my own inserts at some point. This is one gorgeous pillow! Thank you Brandi! I liked how it turned out! I think Priority Mail is handled better too. And I think it goes through faster. And insurance usually guarantees a delivery! I agree. I am also glad I learned this lesson on an item that ended up coming back to me!! Glad your gorgeous pillow had a happy ending! Love your cheery yellow! Wonder what they do with lost items? I have no idea Pam. Sometimes I think their machines eat them!! How terrible that lovely pillow was lost. Thank goodness it found it’s way back to you and will be on it’s way to it’s owner. I am sure she is anxious to get it. Your pillows are incredibly lovely. I am sure you could make any color look great! I was rather sad when I thought it was lost! So happy when it finally showed up and I could get it resent to it’s rightful owner! I’ve never lost anything in the mail, but I am with you on the packaging! I always send it in those boxes and I think they get the special TLC treatment! Thank you Karianne, you have a wonderful day too! Hope the sun is shining as brightly where you are as it is here! Love this pillow! found you from southern savvy….. I pinned the pillow…LOVE it. Of course YOU KNOW how much I love these. You are incredibly talented. Bravo and well done I say, well done! Thanks Laura 🙂 I should make you one – what color would you choose?? Nothing like a good swap – and who wouldn’t want one of those beauties?! Why can’t I sew?! No, not even a button – I know, I’m pathetic! Thanks Kelly, and no, it isn’t pathetic that you cannot sew! We all have different talents and if EVERYONE could sew there wouldn’t be anyone for us seamstresses to sew for!!!! What a crappy experience! I do hope you get your original pillow cover back someday so that you aren’t out that time and money! It’s beautiful, by the way! I just love the color combination and detail. Gorgeous! I did get it back Allison! Finally! So happy it turned up – thanks for coming by – your blog is beautiful, I must do some browsing! 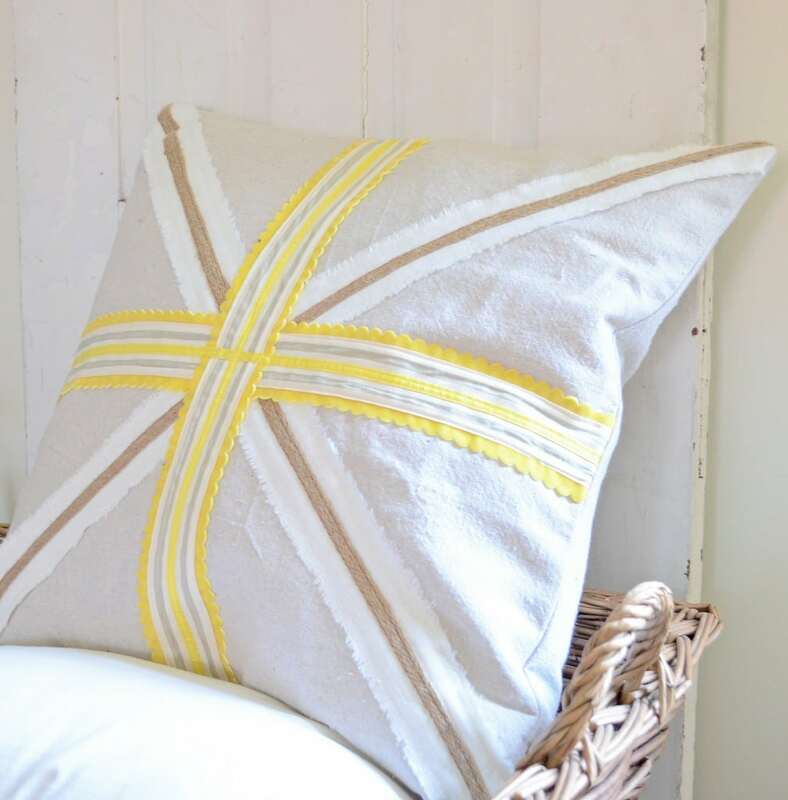 I love the Union Jack, and this slightly yellow calmer color combination makes it more relaxed. Thank you Ira 🙂 I liked the way it turned out too! I like your take on the Union Jack! Very nice! Thank you for sharing your charming project at Potpourri Friday! Hoping you will make it a weekly or regular party stop! Thank you Honey! I’ve got you on my list of linking up blogs! So I will be back! so cute!! sorry you had such a time with the mailing! 🙁 so frustrating! I love the color, fabric, and trims you used. Adorable. Wow! Beautiful pillow! I love your color choices. Glad the story had a happy ending. Can’t wait to what you got in the mail! Thanks Nif!! I can’t wait to show you what I got in the mail! Thank you Karen! I have more scalloped ribbon if you want one of your own 🙂 Thanks again for hosting a party! Oh LOVE IT!!!! And love the yellow and the texture! It is really cute! Thank you for joining me at Home Sweet Home! Thank you Sherry! Always fun to pop over to Home Sweet Home 🙂 Thanks for hosting a party! Thank you Britni! The design part of sewing is my favorite! Thank you Jami! It’s always fun to take a design and do something different with it!